In 2015, when we were all so young and the future seemed so bright, we reported that four movies based on Robin Hood were in development, ranging from gritty reboots of the classic story to different gritty reboots of the classic story. It seemed like a lot, especially since we were just coming off of the days when a dozen Frankenstein adaptations were in the works and the brief window when every TV network wanted some clever twist on Wizard Of Oz. A lot can happen in just a few years, though, including the launch of three additional Robin Hood-based projects. Counting Jamie Foxx and Taron Egerton’s Robin Hood, which looks more like a medieval Green Arrow movie and is coming out in November, that brings us up to seven movies about Robin Hood. NME deserves credit for breaking this down, but let’s look back at the projects we already knew about. 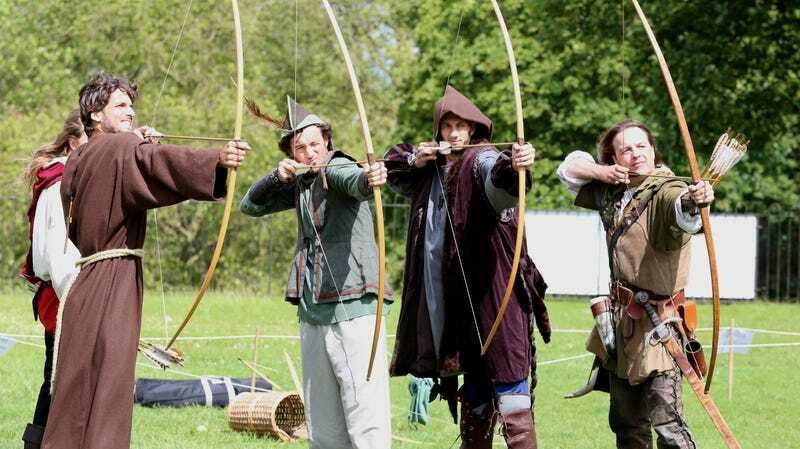 The four we had in 2015 where the aforementioned Robin Hood, originally called Robin Hood: Origins, a version from Sony called Hood that was said to be like Mission: Impossible and would also set off a Robin Hood cinematic universe, a version from Disney called Nottingham & Hood from a script by Brandon Barker, and a take from Warner Bros. that we’re just going to assume was different from the others in some way. Last year, Margot Robbie jumped into the game with Marian, a movie she’s set to star in about Maid Marian becoming a vigilante after Robin Hood is killed. That leaves us with two new ones, which NME says are Robin Hood 2058 and Robin Hood And The Prince Of Aragon. Both of those have ridiculous names, which sets them apart from the others, but they both seem a little more far-fetched than the other four. The first one, as suggested by the name, takes place in a futuristic dystopian London, and it centers on a “rogue MI5 agent on a mission to avenge injustice.” That screams “Syfy original movie,” but io9 said back in 2016 that it was being developed by the producers of 300. The other one, Prince Of Aragon, is apparently a “vibrant punk-pop retelling of the mythos,” but it’s unclear where NME is getting that from or who is actually making it.